The last three months have gone by in a blur. It is now the end of another great season . 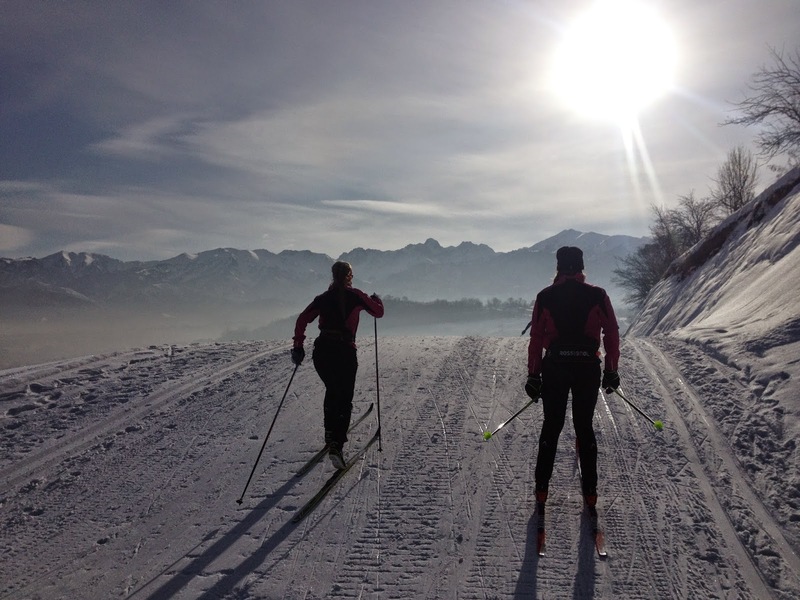 As a cross-country skier, April is the month to reflect on your season and it is also the month of decisions. But before I make any of those, here is a summary of my season. As it was my third time jumping on a plane to represent Canada at World Junior Championships I had a good idea of what to expect. I knew that adjusting to the time change and recovering from jet lag were keys to having good races overseas. However, nothing I had experienced in the past would be comparable to the 11 hour time change and 24 hours of travel time I experienced in travelling to Kazakhstan. Thankfully, we arrived more than a week before the first race. 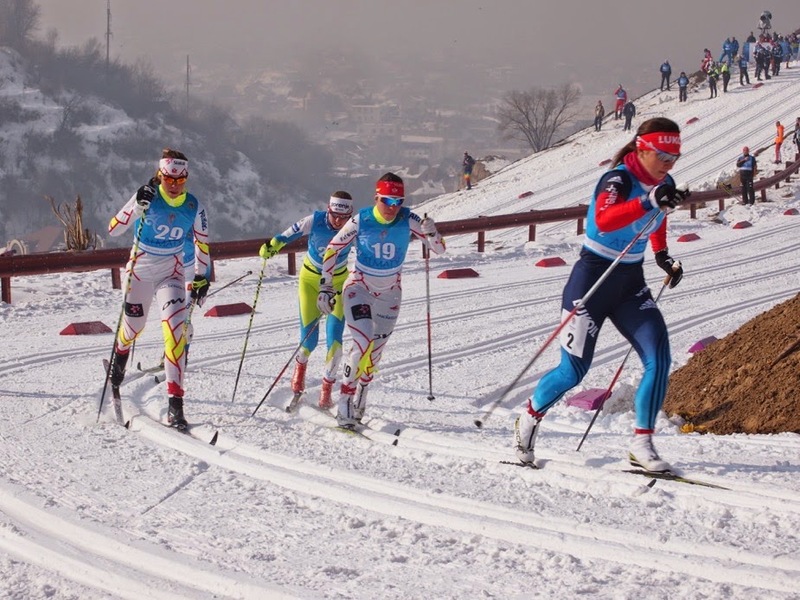 The race venue was situated at the top of a large pile of sand in the middle of the city of Almaty. All of the courses swerved around the top of the hill and were sandwiched between the city and the mountains. If we got to the race site early, there was a beautiful view, but as it got warmer, the smog would rise and we would be skiing in a cloud. 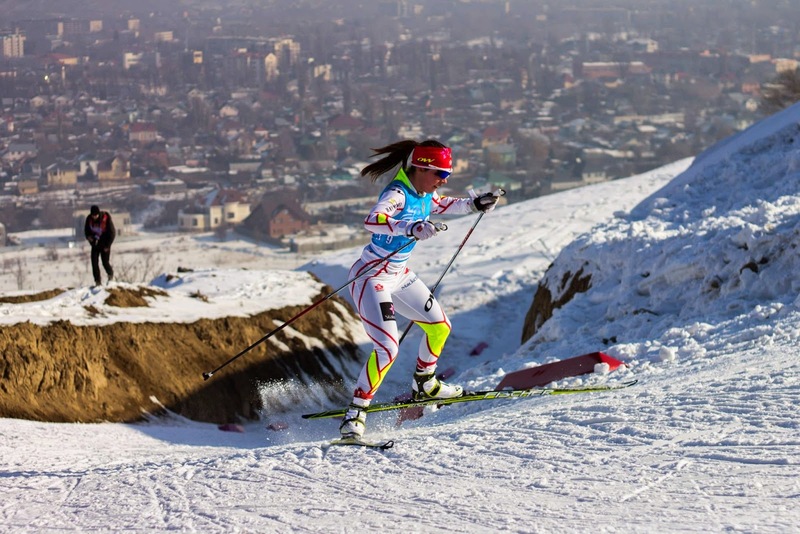 In Almaty there was virtually no snow. So, when we arrived at the race site they were busy unloading snow from trucks and running the snow guns. Parts of the distance courses were ready to ski on but the sprint course was yet to be created. That being said, I was not surprised when the sprint race was delayed by one day. In Kazakhstan, most people do not speak English. We needed the help of a English speaking volunteer in order to get around. One day, we headed over to the Bazaar in Almaty to get a taste of the culture of Kazakhstan. The bazaar was full of alleys of tightly squeezed booths selling everything from socks to carpets. When I tried bargaining down the price of wool socks, I had to grab a calculator and enter in the price so that the salesperson would understand. We also visited the food bazaar where I was a little shocked to see pig heads hanging as a decoration at the booths to show the kind of meat that was being sold. 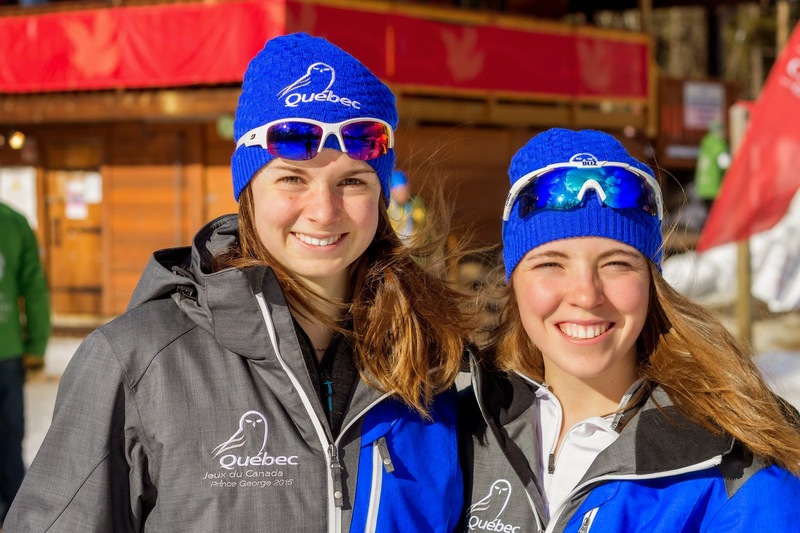 We started the week off well, with 3 junior women finishing in the top 25 in the classic sprint which fired all of us up for the rest of the races. Three days later, I achieved my biggest goal of the season which was to finish top 15 in a distance race. Crossing the finish line in 14th in the skiathlon was an absolutely amazing feeling. 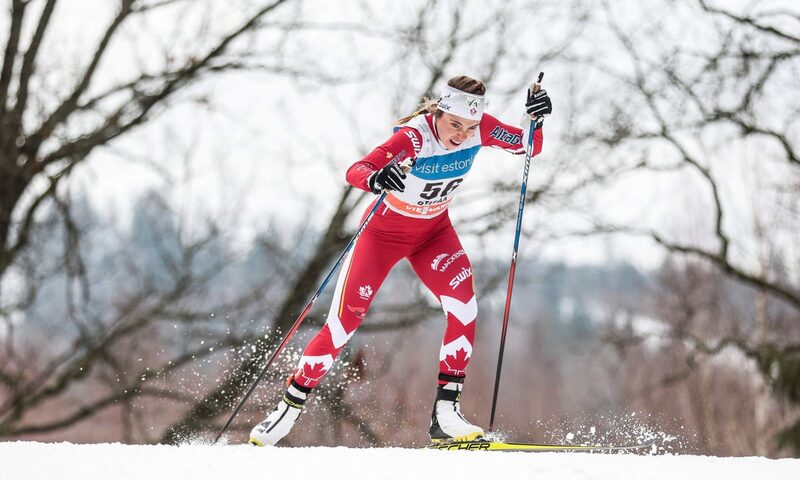 The day after, I was able to watch fellow U23 Canadian Olivia finish 12th in the skiathlon and bust out some of her moves with a celebratory dance at the finish line! Finally, the 4X3.5km relay was, as usual, my favourite race of the week. This can be explained by the fact that it is an opportunity to race not only for yourself, but for your team. It is also the perfect excuse to put matching Canadian flag tattoos on our cheeks and red sparkly ribbons in our hair. This year, I was scramble leg. I had one goal in mind and it was to stick with the front pack for as long as I possibly could. After about 2km, I was in 4th. Unfortunately a skier clipped my ski and I ended up going flying and losing my binding. One of the Canadian coaches was quick to give me a new ski but by that time I had lost the front pack. I spent a good amount of time after the race thinking about what I could have done to avoid the fall but I came to the conclusion that there is no point in wasting time on something you cannot control. Even though things did not go as planned, I was happy with how I skied and I had a great time cheering on my teammates. After World Juniors, I was invited to travel to Europe with other Canadians to race a series of Scandinavian cups. For several reasons, I decided to turn down the offer and head to Canada Winter Games in Prince George BC instead. I had a little more than a week at home to catch up with my 3 Cegep courses and to get over the unavoidable overseas cold before it was time to pack my suitcase again. Canada Winter games are organized to look like mini-Olympics. There is an athlete’s village that is situated close to all the hotels. The village includes a huge cafeteria where we all eat, an athlete’s lounge with various activities and a big stage. The races were held at Otway Nordic Centre. The conditions, the courses and the weather made for an absolutely amazing week of racing! While I was in Prince George, I also had the opportunity to help out at a fast and female event. The season ended as usual with National Championships. 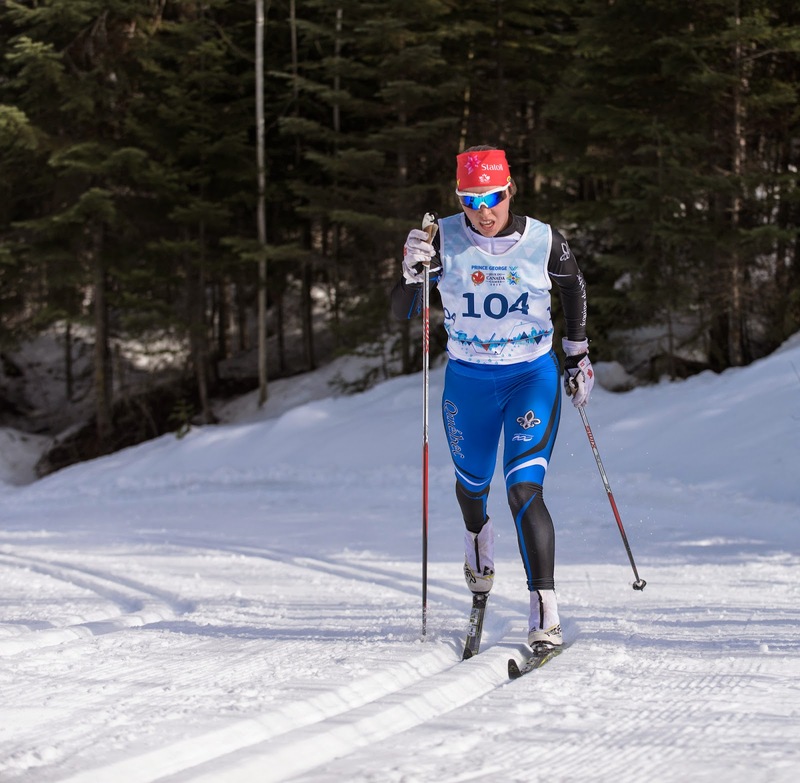 This year they were held in Thunder Bay at Lappe Nordic Centre. The volunteers and organisers made it an absolutely flawless event , thank you! The week started off with the club team sprint. I had been looking forward to this race ever since I had received an e-mail in January from two time Olympian Perianne Jones asking if I would like to be her teammate. Peri has been an inspiration to me for the longest time so it was an honour to race with her. Nationals is probably the toughest competition of the year. Everyone has had a different season and so everyone has a different goal in mind. As for me, I was in survival mode. I had just been through the longest season of my life and it was time to give everything I had left in the tank. I knew it was my last races as a junior so I decided to enjoy every moment of it. Now it is back to reality. I want to thank everyone who made this season such a great one. Thanks Kieran Jones ( my coach) , for going out of your way to help me; for the times you have driven to Chelsea to have a meeting, for all the long e-mails you have answered from the other side of the world and for supporting me every step of the way! My family, for being the absolute best. Thanks Emilie for taking notes for me in class while I was away. My teammates: thanks to all of the Nakkertok crew and the rest of my teammates from around Canada for making workouts and competitions a million times better! All the volunteers and wax technicians who took time off work to come to races and help us race our fastest. Wayne Johannsen, thanks for helping me out with my skis this year. Finally, thanks to the Chelsea Masters for organising the Master to Juniors event that helped pay for my trip to worlds.